Recently I needed to re-install Windows 7 for my laptop. So, as usually, I got my Windows 7 DVD and tried to boot the laptop from DVD. Unfortunately, My DVD drive does not detect any CD or DVD since the DVD drive is not working properly. I tried to do it many times, even check my boot drive priority. But the DVD drive does not detect the Windows 7 DVD. 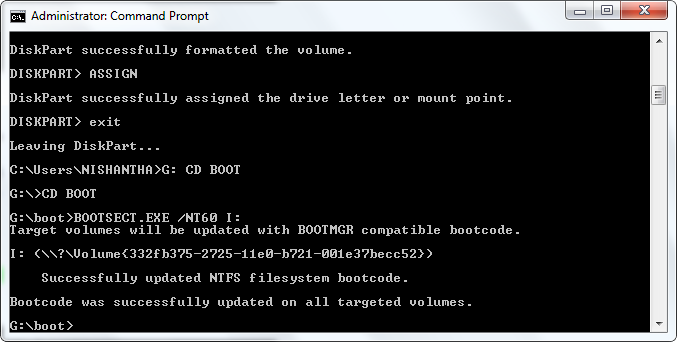 Therefore, I decided to install Windows 7 using my USB drive. Now I am going to explain step by step guidelines with screenshots that I taken. To install Windows 7, you need to have at least 4GB pen drive and Windows 7 installation DVD. In here, you need to perform some commands using Command Prompt. Connect your USB drive to any USB port on your PC or Laptop. Open the Command Prompt (CMD) as an administrator. 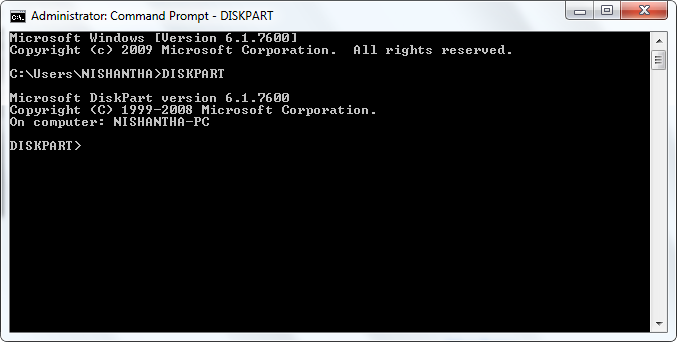 In the CMD type this command DISKPART and press Enter. This will open the Microsoft Diskpart utility as in the figure below. It will show you, all the available drives on your system. 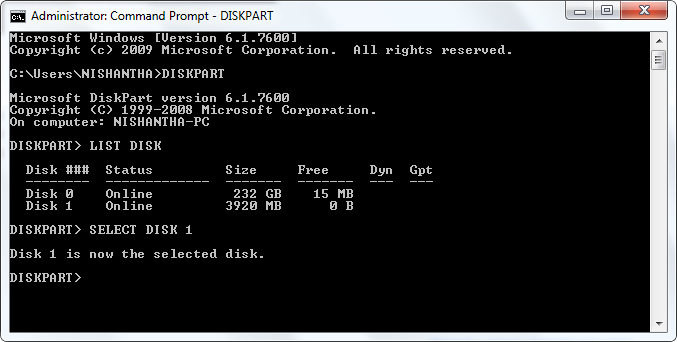 Mostly Disk 0 is the Hard Disk and in my example, Disk 1 is USB drive. if you have another drive number in the system then you need to replace that number with 1. Now issue the list of following commands below to one by one, press Enter after each command. This commands will update the bootcode for all targeted volumes. dvd into the USB Drive. install Windows vista with the same procedure by using Vista DVD. BIOS Setup and enable the USB boot Option.